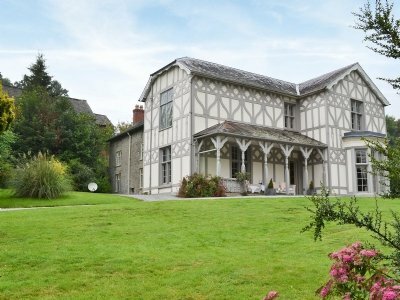 Treburvaugh House can be found just outside the town of Knighton, on the Shropshire/Powys border. Sleeping 16 people, and set in a quiet & rural location, Treburvaugh House is ideal for a holiday with friends and family. Treburvaugh House has a couple of open fires (one in the living room and one in the dining room), and a wood burning stove too - so should you decide to spend a holiday at Treburvaugh House in the winter months, you'll certainly have some cosy nights in. Although a Grade II listed property, Treburvaugh House still has plenty of modern conveniences: there is a satellite TV, CD player, DVD player, and an iPod dock. You also have Wi-Fi - so you can stay online should you choose (and if you've got teenagers in tow, you pretty much have to have Wi-Fi!). Treburvaugh House also has an electric range, microwave, washing machine and tumble dryer. Your bed linen and towels are included in the price of your holiday. Treburvaugh House sleeps 16 people in 7 bedrooms - with the bedrooms being made-up of 6 doubles and a twin. Two of the double bedrooms have a single bed in each. Should you have a dog as part of your holiday, Treburvaugh House allows 2 pets to holiday with you. Outside Treburvaugh House has a lawned garden, with terrace and patio furniture (the photo below shows the garden and outlook across the valley). Treburvaugh House is a couple of miles out of the nearest town of Knighton. You'll find the nearest pub is 1½ miles away. With a choice of shops (including a supermarket), restaurants and pubs about 3½ miles (in Knighton) from Treburvaugh House. The towns of Kington, Leominster, and the current foodies favourite, Ludlow, are all worth a visit for a few hours too. Holidays at Treburvaugh House start on a Friday - with short breaks also being available. Should Treburvaugh House not be to your liking, but you fancy staying in the area around Knighton, you might well be interested in the cottages below. All these cottages are within a few miles of Treburvaugh House.